To retrospectively evaluate the current practice, trends, and outcomes of refractive surgery in Japan. 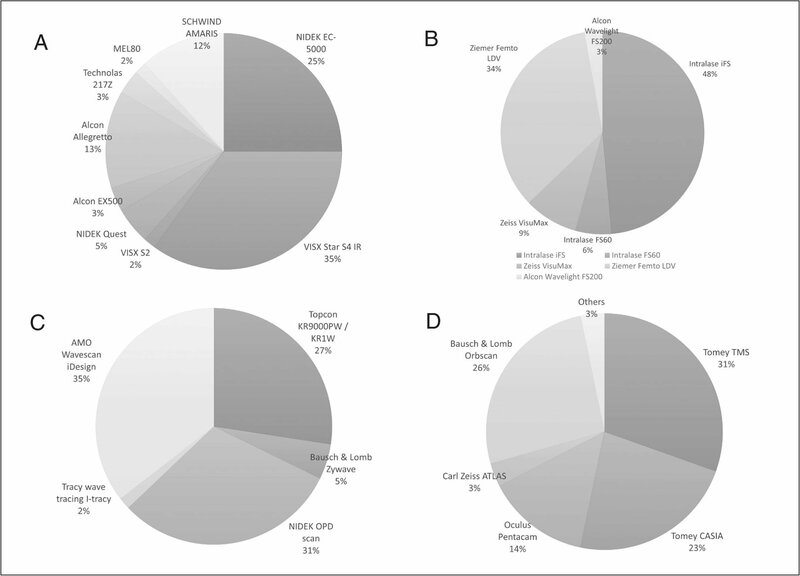 This multicenter survey comprised 78,248 eyes of 39,727 consecutive patients who underwent refractive surgery at 45 major institutions in Japan. The corresponding ophthalmologists responded to a selfadministered questionnaire. The authors especially evaluated the safety, efficacy, predictability, stability, and adverse events of LASIK and phakic intraocular lens (IOL) implantation 3 months postoperatively. 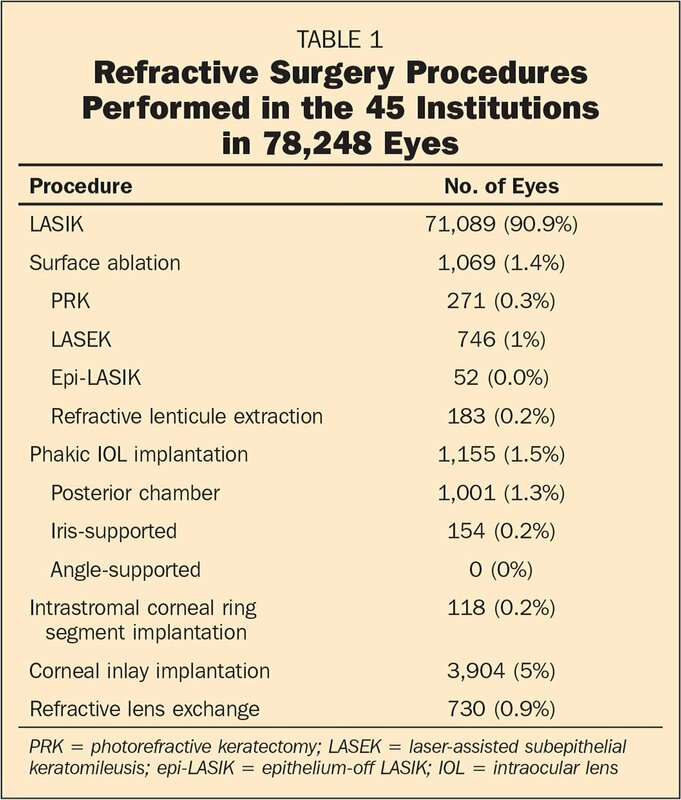 The most common refractive surgery was LASIK (90.9%), followed by corneal inlay (5.0%), posterior chamber phakic IOL implantation (1.3%), laser-assisted subepithelial keratomileusis (1.0%), refractive lens exchange (0.9%), photorefractive keratectomy (0.3%), and refractive lenticule extraction (0.2%). For subgroup analysis, 69,987 eyes (99.5%) and 67,512 eyes (95.9%) achieved corrected and uncorrected distance visual acuity of 20/20 or better, respectively, after LASIK, and 935 eyes (98.8%) and 890 eyes (94.1%), respectively, after phakic IOL implantation. There were 69,176 eyes (98.3%) and 908 eyes (96.0%) within ±1.00 diopter (D) of the attempted correction after LASIK and phakic IOL implantation, respectively. There were 1,926 eyes (2.7%) and 1 eye (0.1%) with changes in refraction of 1.00 D or less from 1 week to 3 months after LASIK and phakic IOL implantation, respectively. No vision-threatening complications occurred in any case. According to this survey, LASIK remains the most prevalent surgical technique in Japan. Both LASIK and phakic IOL implantation offered good safety and efficacy outcomes, yielding predictable and stable results. LASIK and phakic intraocular lens (IOL) implantation have received worldwide recognition as popular surgical approaches for the correction of refractive errors. To date, there have been several nationwide surveys of refractive surgery from Japan,1–4 New Zealand,5–8 the United States,9,10 and Korea,11 and longitudinal data from the United States. After an outbreak of infectious keratitis occurred in a single center,12 and after attention arousing information was provided by the consumer agency of Japan, the number of refractive surgery procedures performed in Japan was estimated to decrease with time. However, a nationwide survey on refractive surgery including demographics, instrumentation, surgical techniques, preferred approaches, and safety and efficacy outcomes has not been fully elucidated so far. It is of clinical importance to understand the current status of refractive surgery in a large cohort of patients, which may provide basic information on the prevalence and modification of these surgical procedures and equipment in medical care. The purpose of the current study was twofold: to retrospectively evaluate the status of contemporary refractive surgery and to specifically assess the overall outcomes of LASIK and phakic IOL implantation in a large cohort of patients presenting at major clinics and hospitals in Japan. In February 2014, a postal self-administered questionnaire was distributed to the responsible ophthalmologists at the 75 medical institutions where refractive surgery was routinely performed in Japan. The data requested included demographics, instrumentation, surgical techniques, the preferred approach for young myopic and middle-aged hyperopic patients, and outcomes and adverse events, particularly for LASIK and phakic IOL implantation. Of the 75 ophthalmologists contacted, 45 (60%) responded and 30 (40%) did not reply after receiving reminder letters. A total of 78,248 eyes of 39,727 patients who underwent refractive surgery at 45 major medical institutions from January to December 2013 were included in this cohort study. This multicenter survey was conducted under the auspices of the Survey Working Group of the Japanese Society of Cataract and Refractive Surgery. Retrospective review of the clinical charts was approved by the institutional review board of Kitasato University and the study followed the tenets of the Declaration of Helsinki. Our institutional review board waived the requirement for informed consent for this retrospective study. For subgroup analysis, we assessed the following parameters 3 months after LASIK and phakic IOL implantation: the percentage of eyes with corrected distance visual acuity (CDVA) and uncorrected distance visual acuity (UDVA) of 20/20 or better, the percentage of eyes within ±1.00 diopters (D) of the attempted correction, and the percentage of eyes with changes in manifest spherical equivalent from 1 week to 3 months postoperatively of 1.00 D or less. A total of 45 (60%) of the 75 institutions responded to the survey. There were 131 ophthalmologists, including 127 medical specialists and 17 consulting physicians in ophthalmology, in these institutions. The age distribution of the ophthalmologists was as follows: 25 to 29 years = 0, 30 to 39 years = 30, 40 to 49 years = 58, 50 to 59 years = 20, and 60 years or older = 23. Figure 1 shows the distribution of instrumentation used in these institutions. Table 1 shows a breakdown of refractive surgery procedures. A breakdown of the (A) excimer lasers, (B) femtosecond lasers, (C) wavefront analyzers, and (D) corneal topographers/tomographers used in the 45 institutions. 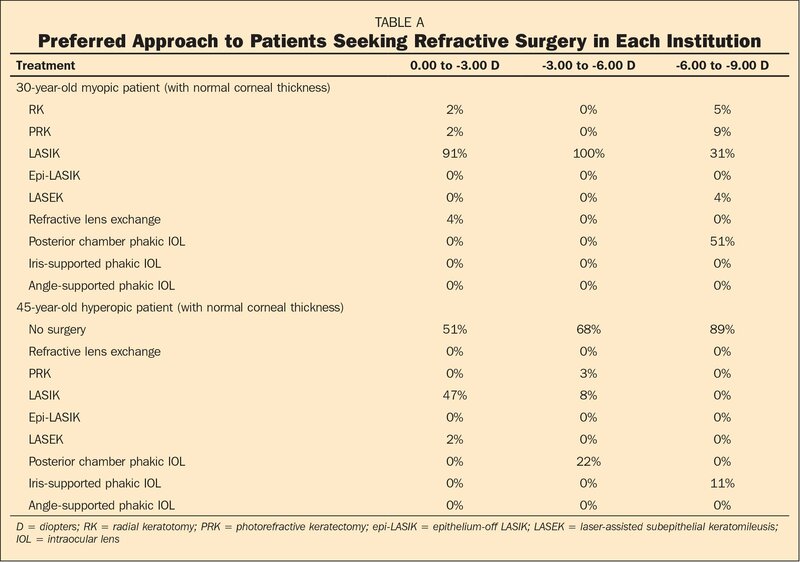 Table A (available in the online version of this article) shows the most preferred approach to the patients seeking refractive surgery in each institution. For young myopic patients, LASIK remained the most preferred surgical approach for low to moderate myopia, whereas phakic IOL implantation was preferred for high myopia. For middle-aged hyperopic patients, the surgeons tended to recommend no surgery, followed by LASIK for low to moderate hyperopia and phakic IOL implantation for high hyperopia. 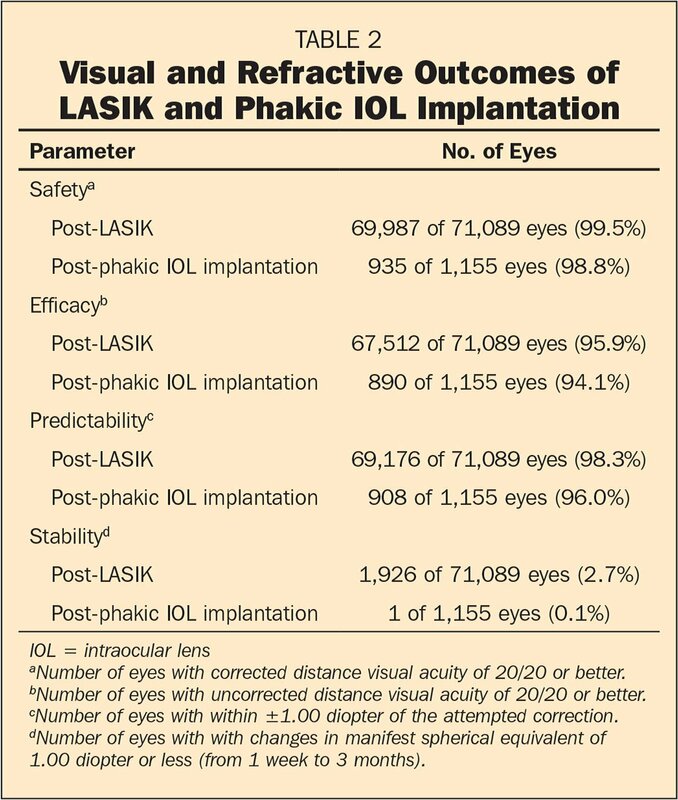 Visual and refractive outcomes of LASIK and phakic IOL implantation are listed in Table 2. 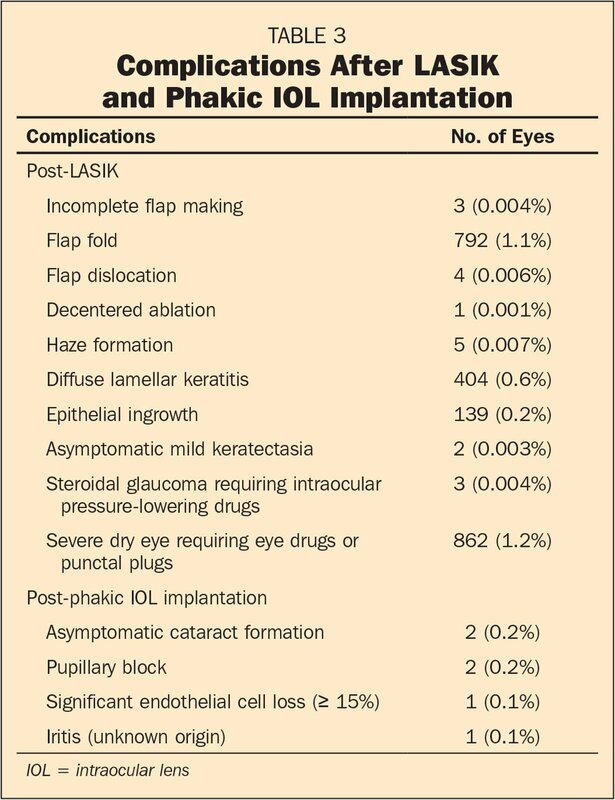 Complications after LASIK and phakic IOL implantation are listed in Table 3. Of the 71,089 post-LASIK eyes, enhancement surgery possibly due to undercorrection, overcorrection, or remaining astigmatism was required in 1,819 eyes (2.6%). Otherwise, neither severe keratectasia, infectious keratitis, nor any other visionthreatening complication was observed in any case. Of the 1,155 eyes implanted with a phakic IOL, phakic IOL exchange was required in 12 eyes (1.0%), largely due to incorrect initial sizing of the phakic IOL. Otherwise, neither symptomatic cataract formation, retinal detachment, endophthalmitis, nor any other visionthreatening complication was observed in any case. Our multicenter retrospective survey showed that the most common refractive surgery performed in Japan was still LASIK (90.9%), followed by corneal inlay (5.0%), posterior chamber phakic IOL implantation (1.3%), LASEK (1.0%), refractive lens exchange (0.9%), PRK (0.3%), and refractive lenticule extraction (0.2%), and that both LASIK and phakic IOL implantation offered good outcomes for the correction of refractive errors without vision-threatening complications. Although the outcomes and complications of refractive surgery at the remaining 35 institutions (40%) were still unclear, our results suggest that both surgeries are feasible surgical options for such patients who seek refractive surgery. To the best of our knowledge, this is the largest cohort study (approximately 78,000 eyes) to retrospectively investigate the actual situation of contemporary refractive surgery. The 2007 New Zealand survey showed that LASIK remains the most preferred approach for eyes having smaller refractive errors, although refractive lens surgery was the preferred treatment in eyes having larger refractive errors.8 The American Society of Cataract and Refractive Surgery worldwide survey of its members demonstrated that LASIK remained the most popular surgery as of the 2003 survey,9 but that PRK (71.0%), refractive lens exchange (58.3%), LASEK (40.8%), and phakic IOL implantation (17.4%) were also performed in the 2004 survey.10 The Korea survey showed that the popularity of LASIK decreased from 78% to 39%, whereas that of phakic IOL implantation steadily increased from 3% to 33% in 2006.11 Sugar et al. demonstrated that LASIK was safe, effective, and predictable for the correction of low to moderate myopia in terms of obtaining excellent UDVA and minimal loss of CDVA, but that results were more variable for the correction of moderate to high myopia.13 However, it should be noted that the surgeons tended to recommend no surgery for middle-aged hyperopic patients in this survey. Otherwise, LASIK was also preferred for low to moderate hyperopia and phakic IOL implantation was preferred for high hyperopia. Varley et al. also reported that LASIK is safe, effective, and predictable for the correction of low to moderate hyperopia, but the results were less compelling because greater amounts of hyperopia were treated.14 Huang et al. showed that phakic IOL implantation provided a better visual outcome than keratorefractive surgeries in cases of high myopia.15 With regard to corneal inlay, this surgery was mostly performed in a single large center for the correction of presbyopia and refractive errors.16 Accordingly, we assume that this surgical technique was not popular at other medical institutions in Japan. The occurrence of intraoperative and postoperative complications in eyes undergoing LASIK and phakic IOL implantation was considerably low. Dos Santos et al. reported that the femtosecond laser improved the overall predictability and safety of the lamellar incision step and most flap complications can be well managed.19 Tse et al. stated that the femtosecond laser has become more common throughout the world with the advent of newer and safer technologies.20 Estopinal and Mian reported that overall flap-related complication rates are low, with several large series reporting complication rates of 1% to 1.8% or less, which tended to decrease with surgeon experience.21 Wolle et al. noted that ectasia remains a rare yet feared complication of refractive surgery and the presence of a validated risk scoring system and new diagnostic modalities will hopefully decrease the incidence of ectasia after LASIK.22 Sugar et al. reported that serious adverse complications leading to significant permanent visual loss such as infections and corneal ectasia probably occur rarely in LASIK procedures, but that side effects such as dry eyes, nighttime starbursts, and reduced contrast sensitivity occur relatively frequently.13 We should be aware that the enhancement rate of LASIK was 2.6%, possibly due to undercorrection, overcorrection, and remaining astigmatism, and that the exchange rate of phakic IOLs was 1.0%, largely due to inadequate initial sizing of the posterior chamber phakic IOL. This survey had several limitations. First, this survey was performed in a retrospective fashion. Second, the observation period was up to 3 months due to the time and staffing limitations of the medical institutions. A prospective study with a long-term follow-up would be ideal for confirming the authenticity of our results because we did not evaluate any late-onset complications such as long-term refractive regression, keratectasia, intraocular pressure rise, and cataract formation. Third, some patients dropped out during the observation period. Because the patients who were satisfied with their visual performance after refractive surgery tended to be lost to the follow-up, we cannot deny the possibility that some bias in patient selection existed in this study. Our retrospective survey supports the view that LASIK remains the most popular surgical approach for the treatment of refractive errors and that both LASIK and phakic IOL implantation provided good safety and efficacy outcomes, yielding predictable and stable results, without vision-threatening complications. Although a long-term follow-up is still necessary, we believe that contemporary refractive surgeries, such as LASIK and phakic IOL implantation, are feasible options for the treatment of refractive errors. Oshika T, Masuda K, Hayashi F, Leaming DV. Current trends in cataract and refractive surgery in Japan—1992 survey. Jpn J Ophthalmol. 1993;37:432–444. Oshika T, Masuda K, Hayashi F, Majima Y, Leaming DV. Current trends in cataract and refractive surgery in Japan—1994 survey. Jpn J Ophthalmol. 1995;39:265–273. Oshika T, Masuda K, Majima Y, Hayashi F, Leaming DV. Current trends in cataract and refractive surgery in Japan—1995 survey. Jpn J Ophthalmol. 1996;40:419–433. From the School of Allied Health Sciences, Kitasato University, Kanagawa, Japan (KK); the Department of Ophthalmology, Sanno Hospital, Tokyo, Japan (AI); Hayashi Eye Hospital, Fukuoka, Japan (KH); the Department of Ophthalmology, Keio University, Tokyo, Japan (KN); Sato Eye Clinic, Ibaraki, Japan (MS); and the Department of Ophthalmology, Tokyo Dental College, Suidobashi Hospital, Tokyo, Japan (HB-M).